This document is distributed under the terms of the GNU Free Documentation License, version 1.2. Matej’s comments considered (after Channel Access for Java implementation). Description of CA_PROTO_READ and CA_PROTO_READ_SYNC added. Transformed to AsciiDoc format. Recreated graphics. This document describes the EPICS Channel Access (CA) protocol as it is, and has been, implemented. It is also intended to act as a specification to allow the creation of new client and server implements. The focus is on versions >= 4.11 of the CA protocol, which used by EPICS Base 3.14.0 and later. No changes from protocol versions before 4.8 (EPICS Base 3.13.0) will be included in this document. For the benefit of those writing new clients and servers RFC 2119:Key words for use in RFCs to Indicate Requirement Levels are used. A Process Variable (PV) is the addressable unit of data accessible through the Channel Access protocol. Each PV has a unique name string and SHOULD be served by a single Channel Access server. Specifically, when searching for a PV, each client MUST NOT receive replies identifying more than one server. A TCP connection between a CA client and server is referred to as a Virtual Circuit. Typically only one Circuit is opened between each client and server. However, a client MAY open more than one Circuit to the same server. The following tree diagram illustrates the order in which normal (not error) CA messages can be sent on a TCP connection. Nodes with box borders are messages sent be the server, and oval borders are messages sent be the client. Nodes with a double border (eg. "Open Socket") are not themselves messages. Instead they indicate pre-conditions which must be meet before certain messages can be sent. The message CA_ERROR may be sent by a server in response to any client message. A Channel is the association between a particular Circuit and PV name. At core, a Channel is a runtime allocated pair of integer identifiers (CID and SID) used in place of the PV name to avoid the overhead of string operations. Both client and server MUST maintain a list of the identifiers of all open Channels associated with a Circuit. The scope of these identifiers is a single Circuit. Identifiers from one Circuit MUST NOT be used on any other. Further more, the same identifier number may be used one two different Circuit in connection with two different PV names. A Channel’s identifiers are explained in section Message Identifiers. A monitor is created on a channel as a means of registering/subscribing for asynchronous change notifications (publications). Monitors may be filtered to receive only a subset of events (Event Mask), such as value or alarm changes. Several different monitors may be created for each channel. Clients SHOULD NOT create two monitors on the same channel with the same Event Mask. Server beacons messages (CA_PROTO_RSRV_IS_UP) MUST be periodically broadcast. Beacon messages contain the IP address and TCP port on which the server listens A sequential beacon ID is also included. When a server becomes active, it MUST immediately begin sending beacons with an increasing delay. An initial beacon interval of 0.02 seconds is RECOMMENDED. After each beacon is sent the interval SHOULD be increased up to a maximum interval. Doubling the interval is RECOMMENDED. The RECOMMENDED maximum interval is 15 seconds. As a server sends beacons it MUST increment the BeaconID field for each message sent. CA clients MAY use a server’s first beacon as a trigger to re-send previously unanswered CA_PROTO_SEARCH messages. While it was done historically, clients SHOULD NOT use Beacons to make timeout decisions for TCP Circuits. The CA_PROTO_ECHO message should be used instead. Clients wishing to detect new servers should maintain a list of all servers along with the last BeaconID received, and the reception time. Servers SHOULD be removed from this list when no Beacon is received for some time (two beacon periods is RECOMMENDED). CA clients typically SHOULD NOT automatically reconnect Circuits which have become unresponsive, instead CA clients SHOULD send a new CA_PROTO_SEARCH request. CA clients SHOULD on occasion re-send PV name searches which are not answered. Care must be taken to avoid excessive network load due to repeated lookups and connections. Clients are RECOMMENDED to implement an exponentially increasing (up to a maximum) interval when re-sending CA_PROTO_SEARCH messages for each PV. Clients are RECOMMENDED to implement a timeout before re-starting a search when a Channel is closed due to an Exception, or Channel creation fails with CA_PROTO_CREATE_CH_FAIL reply. Certain aspects of Channel Access protocol have changed between releases. In this document, Channel Access versions are identified using CA_VXYY, where X represents single-digit major version number and YY represents a single- or double-digit minor version number. Stating that a feature is available in CA_VXYY implies that any client supporting version XYY must support the feature. Implementation must be backward compatible with all versions up to and including its declared supported minor version number. CA_V43, denotes version 4.3 (major version 4, minor version 3). Channel Access protocol carries an implicit major version of 4. Minor version begin with 1. Minor version 0 is not a valid version. When a Virtual Circuit is created both client and server send their minor version numbers. The valid messages and semantics of the Circuit are determined by the lower of the two minor versions. Channel Access protocol error messages (CA_PROTO_ERROR) are referred to as Exceptions. Exceptions are sent by a CA server to indicate its failure to process a client message. An Exception MAY be sent in response to any client message, including those which normally would not result in a reply. Exception messages carry the header of the client message which triggered the error. It is therefore always possible to associate an Exception with the request which triggered it. A CA server will maintain at least two sockets. A UDP socket bound to the CA port (def. 5064) MUST listen for PV name search request broadcasts. PV name search replies are sent as unicast messages to the source of the broadcast. This socket, or another UDP socket, SHOULD periodically send Beacons to the CA Beacon port (def. 5065). A TCP socket listening on an arbitrary port. The exact port number is included in PV name search replies. This socket will be used to build Virtual Circuits. A CA server SHOULD NOT answer PV name search requests for itself unless a CA_PROTO_CREATE_CHAN for that PV from the same client can be expected to succeed. To do otherwise risks excessive load in a tight retry loop. A CA client SHOULD maintain a registration with a Repeater on the local system, (re)starting it as necessary. Clients will send PV name search messages and listen for replies. Typically a client will maintain a table of unanswered name searches and a cache of recent results in order avoid duplicate searches, and to process any replies. Once an affirmative search reply is received, a Virtual Circuit to the responder is opened if needed. If the client already has a circuit open to this server, it SHOULD be reused. When a Circuit is available, a Channel is created on it, then various get/put/monitor operations are performed on this Channel. The process of finding the server which advertises a PV to a particular client can be carried out over UDP, or with >= CA_V412 over a TCP connection. In either case each client SHOULD be pre-configured with a set of destinations to send queries. For UDP searching, this is a list of unicast or broadcast endpoints (IP and port). For TCP searching, this is a list of endpoints. It is RECOMMENDED that a default set of UDP endpoints be populated with the broadcast addresses of all network interfaces except the loopback. It is RECOMMENDED that, on client startup, Circuits be established to all endpoints in the TCP search list. Search results are transitory. Subsequent searches MAY yield different results. Therefore queries SHOULD be re-tried unless an active Channel is already open. Several CA messages MAY be included in one UDP datagram. A datagram which includes CA_PROTO_SEARCH messages MUST begin with a CA_PROTO_VERSION message. For efficiency it is RECOMMENDED to include as many search requests as possible in each datagram, subject to datagram size limits. A CA server MUST NOT send a CA_PROTO_NOT_FOUND in response to a UDP search request. CA_PROTO_SEARCH messages MUST NOT be sent on a Circuit unless a CA_PROTO_VERSION message has been received indicating >= CA_V412. When supported, CA_PROTO_SEARCH messages may be sent at any time the circuit is open. A CA server MAY send a CA_PROTO_NOT_FOUND in response to a UDP search request if the DO_REPLY bit is set. Clients MAY ignore CA_PROTO_NOT_FOUND messages. A CA_PROTO_NOT_FOUND message is not final. A subsequent search might yield a different result. When a Circuit is created, both client and server MUST begin a countdown timer. When any traffic (including a CA_PROTO_ECHO message) is received on the Circuit, this counter is reset to its initial value. If the timer reaches zero, the Circuit is closed. Clients MUST send a CA_PROTO_ECHO message before the countdown reaches zero. It is RECOMMENDED to send an echo message when the countdown reaches half its initial value. When a CA_PROTO_ECHO message is received by the server, it MUST be immediately copied back to the client. The RECOMMENDED value for the countdown timer is 30 seconds. When a Circuit is created, both client and server MUST send CA_PROTO_VERSION as their first message. This message SHOULD be sent immediately. Note for implementers. For EPICS Base before 3.14.12, RSRV did not immediately send a version message due to a buffering problem. Instead the version message was not sent until some other reply forced a flush of the send queue. In addition the client SHOULD send CA_PROTO_HOST_NAME and CA_PROTO_CLIENT_NAME messages. Once this is done, the Circuit is ready to create channels. Note that the host and client name messages SHOULD NOT be (re)sent after the first channel is created. If the client or host name strings change, the circuit SHOULD be closed. If no host or client name messages are received a server MUST consider the client to be anonymous. It is RECOMMENDED that anonymous users not be granted rights for the Put operation. Channel creation starts with a CA_PROTO_CREATE_CHAN request from the client. This message includes the PV name string, and a client selected CID. If the server can not provide the named PV it replies with CA_PROTO_CREATE_CH_FAIL using the same CID. The server MUST NOT remember the CID of failed creation requests as clients MAY re-used them immediately. If the server can provide the named PV, it replies with CA_PROTO_ACCESS_RIGHTS followed by a CA_PROTO_CREATE_CHAN reply. Further CA_PROTO_ACCESS_RIGHTS messages MAY follow to reflect changes to access permissions. Note that the CA_PROTO_CREATE_CHAN reply includes the Channel’s native DBR datatype and the maximum number of elements which can be retrieved/set by a get, put, or monitor operation. These attributes are fixed for the lifetime of the channel. The reply also contains the server selected SID identifier. Together with the CID, these two identifier will be used to refer to the Channel in subsequent operations. The Channel remains active, and the identifiers valid, until a CA_PROTO_CLEAR_CHANNEL request is sent by a client and its reply received, until a CA_PROTO_SERVER_DISCONN message is received by a client, or if the circuit (TCP connection) is closed. After a server sends a CA_PROTO_CLEAR_CHANNEL reply or a CA_PROTO_SERVER_DISCONN message it MAY reuse the SID immediately. After a client receives a CA_PROTO_CLEAR_CHANNEL reply or a CA_PROTO_SERVER_DISCONN message it MAY reuse the CID immediately. Therefore after a client sends a CA_PROTO_CLEAR_CHANNEL request, or a sever sends a CA_PROTO_SERVER_DISCONN request, no further messages (including CA_PROTO_ERROR) should be sent for the closed channel. A Operation to write data to a Channel begins with a CA_PROTO_WRITE or CA_PROTO_WRITE_NOTIFY request. The difference between the two is that CA_PROTO_WRITE_NOTIFY gives a reply on success, while CA_PROTO_WRITE does not. The CA_PROTO_WRITE SHOULD be used when it is not important that all Put operations are executed. A server SHOULD make best effort to ensure that, when a burst of CA_PROTO_WRITE requests is received, that the last request is processed (others could be dropped). A CA_PROTO_WRITE_NOTIFY request indicates that the client intends to wait until the request is fulfilled before continuing. A server MUST reply to all CA_PROTO_WRITE_NOTIFY requests. A server SHOULD make best effort to fully process all CA_PROTO_WRITE_NOTIFY requests. Both request messages include a SID to determine which Channel is being operated on. In addition, a client selected IOID is included. This identifier will be included in a CA_PROTO_WRITE_NOTIFY reply, as well as any CA_PROTO_ERROR exception message resulting from a Put request. The present value of a Channel is queried with a CA_PROTO_READ_NOTIFY request. A server MUST reply to all CA_PROTO_READ_NOTIFY requests. A server SHOULD make best effort to fully process all CA_PROTO_READ_NOTIFY requests. CA_PROTO_READ_NOTIFY messages include a SID to determine which Channel is being operated on, as well as a client selected IOID which will be included in the reply. The IOID MUST be unique on the channel. A Monitor operation is a persistent subscription which is initiated by a CA_PROTO_EVENT_ADD request and terminated with a CA_PROTO_EVENT_CANCEL request. Both CA_PROTO_EVENT_ADD and CA_PROTO_EVENT_CANCEL messages include a channel SID as well as a client selected SubscriptionID. The SubscriptionID MUST be unique on the channel. When a subscription is created a server SHOULD immediately send a CA_PROTO_EVENT_ADD reply with the present value of the Channel if such a value is available. After a CA_PROTO_EVENT_CANCEL request is received, a server MUST send one final CA_PROTO_EVENT_ADD reply with a zero payload size. Before a CA_PROTO_EVENT_CANCEL request is received, a server MUST NOT send a CA_PROTO_EVENT_ADD reply with a zero payload size. Any client message MAY result in an CA_PROTO_ERROR reply from a server. Prior to CA_V413, the element count in a CA_PROTO_EVENT_ADD or CA_PROTO_READ_NOTIFY reply MUST be the same as given in the corresponding CA_PROTO_EVENT_ADD or CA_PROTO_READ_NOTIFY request. A request for zero elements MUST result in an ECA_BADCOUNT exception. If a server can not provide all of the elements requested, then it fills out the message body with null bytes. Beginning in CA_V413, a request for zero elements is valid. The element count in a reply is then the number of elements the server could provide (perhaps zero). The element count in a reply MUST NOT exceed the maximum element count on the channel. This dynamic array size feature creates a potential ambiguity in the protocol if the number of bytes in a CA_PROTO_EVENT_ADD reply is zero. Therefore it is RECOMMENDED that clients not create dynamic monitors for the plain DBR_* types. Clients needing to create such monitors are RECOMMENDED to promote the type to the corresponding DBR_STS_* (the extra meta-data can be ignored for internal processing). Then a zero element count has a non-zero body size. Note to implementers. RSRV will always give at least one element in CA_PROTO_EVENT_ADD replies. libca will silently ignore CA_PROTO_EVENT_ADD replies with zero size before a CA_PROTO_EVENT_CANCEL request is received. This section defines all primitive data types employed by CA, as well as their C/C++ equivalents. These data types are referred to in the subsequent sections. Array of UBYTE`s. If `[n] is specified, it indicates maximum allowed number of characters in this string including (if neccessary) termination character. All values are transmitted over the network in big-endian (network) order. For example: UINT32 3145 (0x00000C49) would be sent over the network represented as 00 00 0C 49. All Channel Access messages are composed of a header, followed by the payload. Header is always present. The command ID and payload size fields have a fixed meaning. Other header fields carry command-specific meaning. If a field is not used within a certain message, its value MUST be zeroed. Total size of an individual message is limited. With CA versions older than CA_V49, the maximum message size is limited to 16384 (0x4000) bytes. Out of these, header has a fixed size of 16 (0x10) bytes, with the payload having a maximum size of 16368 (0x3ff0) bytes. Versions CA_V49 and higher may use the extended message form, which allows for larger payloads. The extended message form is indicated by the header fields Payload Size and Data Count being set to 0xffff and 0, respectively. Real payload size and data count are then given as UINT32 type values immediately following the header. Maximum message size is limited by 32-bit unsigned integer representation, 4294967295 (0xffffffff). Maximum payload size is limited to 4294967255 (0xffffffe7). For compatibility, extended message form should only be used if payload size exceeds the pre-CA_V49 message size limit of 16368 bytes. Names of header fields are based on their most common use. Certain messages will use individual fields for purposes other than those described here. These variations are documented for each message individually. All of values in header are unsigned integers. Identifier of the command this message requests. The meaning of other header fields and the payload depends on the command. Size of the payload (in bytes). MUST not exceed 0x4000 for UDP. Identifier of the data type carried in the payload. Data types are defined in section Payload Data Types. Number of elements in the payload. The structure of the payload depends on the type of the message. The size of the payload matches the Payload Size header field. Message payloads MUST be padded to a length which is a multiple of 8 bytes. Zero padding is RECOMMENDED. Some fields in messages serve as identifiers. These fields serve as identification tokens in within the context of the a circuit (TCP connection). The RECOMMENDED scheme for allocating these values is to create them sequentially starting at 0. All IDs are represented with UINT32. Overflow of all identifiers MUST be handled! A long running applications might use more than 2**32 of some identifier type type (typically IOID). A CID is the client selected identifier for a channel. A CID MUST be unique for a single Circuit. Clients MUST not send a request with a CID which is not associated with an active Channel. Servers MUST ignore any request which does not include the CID of an active channel without closing the Circuit. A CID is found in the Parameter 1 field of CA_PROTO_ERROR, CA_PROTO_CREATE_CHAN, CA_PROTO_ACCESS_RIGHTS, CA_PROTO_CREATE_CH_FAIL, and CA_PROTO_SERVER_DISCONN messages. And in the Parameter 2 field of CA_PROTO_CLEAR_CHANNEL message. A SID is the server selected identifier for a channel. A SID MUST be unique for a single Circuit. Servers MUST not send a request with a SID which is not associated with an active Channel. Clients MUST ignore any request which does not include the SID of an active channel without closing the Circuit. A SubscriptionID is the client selected identifier for a subscription. A CID MUST be unique for a single Circuit. A SubscriptionID is found in the Parameter 2 field of CA_PROTO_EVENT_ADD and CA_PROTO_EVENT_CANCEL messages. An IOID is the client selected identifier for a Get or Put operation. An IOID MUST be unique for a single message type on a single Circuit. It is possible though NOT RECOMMENDED to use the same IOID concurrently in a CA_PROTO_WRITE, a CA_PROTO_READ_NOTIFY, and a CA_PROTO_WRITE_NOTIFY request. An IOID is found in the Parameter 2 field of CA_PROTO_READ_NOTIFY, CA_PROTO_WRITE_NOTIFY, and CA_PROTO_WRITE messages. A SearchID is a client selected identifier for a PV name search. A SearchID must be unique for each client endpoint sending requests. Due to the nature of UDP it is possible for datagrams to be duplicated. Several CA_PROTO_SEARCH messages with the same SearchID MAY be considered to be duplicates, and only one used. The following commands are sent as either UDP datagrams or TCP messages. Some of the messages are also used within the context of a Virtual Circuit (TCP connection). Exchanges client and server protocol versions and desired circuit priority. MUST be the first message sent, by both client and server, when a new TCP (Virtual Circuit) connection is established. It is also sent as the first message in UDP search messages. Minor protocol version number. Only used when sent over TCP. Server will send response immediately after establishing a virtual circuit. Message does not include minor version number (it is always 0) and is interpreted as an echo command that carries no data. Version exchange is performed immediately after CA_PROTO_CREATE_CHAN. Priority indicates the server’s dispatch scheduling priority which might be implemented by a circuit dedicated thread’s scheduling priority in a preemptive scheduled OS. Due to a buffering bug, RSRV implementing < CA_V411 did not send CA_PROTO_VERSION immediately on connection, but rather when some other other response triggers a buffer flush. Server will not respond to request, but send response immediately after establishing a virtual circuit. Message does not include minor version number (it is always 0). Searches for a given channel name. Sent over UDP or TCP. Padded size of channel name. Search Reply Flag, indicating whether failed search response should be returned. Client minor protocol version number. Name of channel to search for. Sent as a UDP datagram. It is illegal to specify DO_REPLY flag whenever the message is sending as UDP datagram, regardless of whether broadcast or multicast is used. SearchID will be allocated by the client before this message is sent. SearchID field value is duplicated. Reply flag will be generally DONT_REPLY when searching using broadcast and DO_REPLY when searching using unicast. When DO_REPLY is set, server will send a CA_PROTO_NOT_FOUND message indicating it does not have the requested channel. TCP Port number of server that responded. Temporary SID (deprecated) or server IP address. Search ID field value (CID) is copied from the request. Before CA_V411 the SID/IP field will always have the value of 0xffffffff and the server IP address is assumed to be the senders IP. Starting with CA_V411 the server’s IP address is encoded in the SID/IP field if it differs from the sender’s IP, or 0xffffffff if it is the same. The port number included in the header is the TCP port of the server. Two servers on the same host can share a UDP port number, but not a TCP port number. Therefore, the port the client needs to connect to in that situation may not be the same as expected if this field in the response is not used. Indicates that a channel with requested name does not exist. Sent in response to CA_PROTO_SEARCH, but only when its DO_REPLY flag was set. Sent over UDP. Same reply flag as in request: always DO_REPLY. Contents of the header are identical to the request. Original request payload is not returned with the response. Connection verify used by CA_V43. Sent over TCP. The following commands are sent as UDP datagrams. Beacon sent by a server when it becomes available. Beacons are also sent out periodically to announce the server is still alive. Another function of beacons is to allow detection of changes in network topology. Sent over UDP. TCP Port the server is listening on. May contain IP address of the server. IP field may contain IP of the server. If IP is not present (field Address value is 0), then IP may be substituted by the receiver of the packet (usually repeater) if it is capable of identifying where this packet came from. Any non-zero address must be interpreted as server’s IP address. BeaconIDs are useful in detecting network topology changes. In certain cases, same packet may be routed using two different routes, causing problems with datagrams. If multiple beacons are received from the same server with same BeaconID, multiple routes are the cause. If a server is restarted, it will most likely start sending BeaconID values from beggining (0). Such situation must be anticipated. Confirms successful client registration with repeater. Sent over UDP. Address with which the registration succeeded. Since repeater can bind to different local address, its IP is reported in Repeater address. This address will be either 0.0.0.0 or 127.0.0.1. Requests registration with the repeater. Repeater will confirm successful registration using CA_REPEATER_CONFIRM. Sent over TCP. The following commands are used within the context of Virtual Circuit and are sent using TCP. Creates a subscription on a channel, allowing the client to be notified of changes in value. A request will produce at least one response. Sent over TCP. Desired DBR type of the return value. SID of the channel on which to register this subscription. See SID - Server ID. Subscription ID identifying this subscription.See Subscription ID. All payload fields except Mask are initialized to 0 and are present only for backward compatibility. Successful subscription will result in an immediate response with the current value. Additional responses will be sent as the change occurs based on the Mask parameter. Mask defines a filter on which events will be sent. A subscription should be destroyed when no longer needed to reduce load on server. See CA_PROTO_EVENT_CANCEL. Status code (ECA_NORMAL on success). Value stored as DBR type specified in Data Type field. See Payload Data Types. Response data type and count match that of the request. To confirm successful subscription, first response will be sent immediately. Additional responses will be sent as the change occurs based on mask parameters. Clears event subscription. This message will stop event updates for specified channel. Sent over TCP. Same value as in corresponding CA_PROTO_EVENT_ADD. Both SID and SubscriptionID are used to identify which subscription on which monitor to destroy. Actual data type and count values are not important, but should be the same as used with corresponding CA_PROTO_EVENT_ADD. Same value as CA_PROTO_EVENT_ADD request. Notice that the response has CA_PROTO_EVENT_ADD command identifier! Regardless of data type and count, this response has no payload. Read value of a channel. Sent over TCP. Deprecated since protocol version 3.13. Desired type of the return value. Desired number of elements to read. SID of the channel to read. Channel from which to read is identified using SID. Response will contain the same IOID as the request, making it possible to distinguish multiple responses. Size of DBR formatted data in payload. Value stored as DBR type specified in Data type field. Data count specifies number of elements of DBR value field. Writes new channel value. Sent over TCP. There is no response to this command. Disables a server from sending any subscription updates over this virtual circuit. Sent over TCP. This mechanism is used by clients with slow CPU to prevent congestion when they are unable to handle all updates received. Effective automated handling of flow control is beyond the scope of this document. This request will disable sending of subscription updates on the server to which it is sent. Command applies to a single virtual circuit, so having multiple priority virtual circuit connections to the server would only affect the one on which the message is sent. No response will be sent for this request. Enables the server to resume sending subscription updates for this virtual circuit. Sent over TCP. This mechanism is used by clients with slow CPU to prevent congestion when they are unable to handle all updates received. Effective automated handling of flow control is beyond the scope of this document. This request will enable sending of subscription updates on the server to which it is sent. Sends error message and code. This message is only sent from server to client in response to any request that fails and does not include error code in response. This applies to all asynchronous commands. Error message will contain a copy of original request and textual description of the error. Sent over UDP. Size of the request header that triggered the error plus size of the error message. CID of the channel for which request failed. Header of the request that caused the error. A null-terminated string conveying the error message. Complete exception report is returned. This includes error message code, CID of channel on which the request failed, original request and string description of the message. CID value depends on original request and may not actually identify a channel. First part of payload is original request header with the same structure as sent. Any payload that was part of this request is not included. Textual error message starts immediately after the header. Clears a channel. This command will cause server to release the associated channel resources and no longer accept any requests for this SID/CID. SID of channel to clear. CID of channel to clear. Server responds immediately and only then releases channel resources. Once a channel with a given SID has been cleared, any request sent with this SID will fail. Requests creation of channel. Server will allocate required resources and return initialized SID. Sent over TCP. Padded length of channel name. CID of the channel to create. Name of channel to create. CID sent should be the same as used with CA_PROTO_SEARCH. SID will be associated with CID on the server and will be reused sending certain commands that require it as a parameter. SID will be valid until the channel is cleared using CA_PROTO_CLEAR or server destroys the PV the channel references. Sends local username to virtual circuit peer. This name identifies the user and affects access rights. This is a one-way message and will not receive response. String in payload must be 0 padded to a length that is multiple of 8. Sends local host name to virtual circuit peer. This name will affect access rights. Sent over TCP. Length of host name string. This is one-way message and will receive no response. Notifies of access rights for a channel. This value is determined based on host and client name and may change during runtime. Client cannot change access rights nor can it explicitly query its value, so last received value must be stored. Access rights for given channel. Access Rights affect CA_PROTO_READ_NOTIFY, CA_PROTO_WRITE_NOTIFY and CA_PROTO_WRITE. CA_PROTO_ACCESS_RIGHTS will be sent immediately after a channel is created using CA_PROTO_CREATE_CHAN. If they change during runtime, this message sent to report new value. Changes are only sent to currently connected channels, since it requires valid CID. Reports that channel creation failed. This response is sent to when channel creation in CA_PROTO_CREATE_CHAN fails. Notifies the client that server has disconnected the channel. This may be since the channel has been destroyed on server. Sent over TCP. Channel access defines special structures to transferring data. 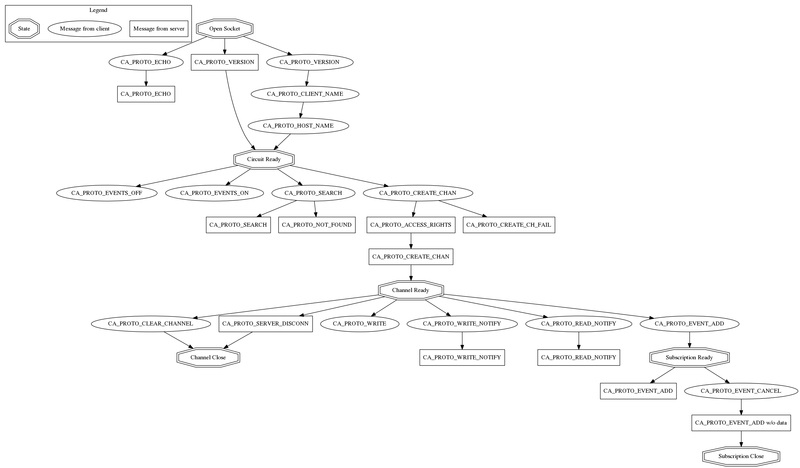 These types are organized in typed hierarchies with loose inheritance. There are six basic data types: DBR_STRING, DBR_SHORT, DBR_FLOAT, DBR_ENUM, DBR_CHAR, DBR_LONG and DBR_DOUBLE. The type DBR_INT is present as an alias for DBR_SHORT. Each of these types can represent an array of elements. In addition to element values, some DBR types include meta-data. These types are status (DBR_STS_*), time stamp (DBR_TIME_*), graphic (DBR_GR_*) and control (DBR_CTRL_*). All these structures contain value as the last field. All DBR data MUST be zero padded to ensure that message body length is a multiple of 8 bytes. Therefore, when receiving a message, it is necessary to use the DBR type and element count to determine the number of body bytes to use. Additional body bytes MUST be ignored. In addition to zero padding at the end of the message, some padding is placed between the meta-data and the value array. The following table lists the identifier, meta-data size, padding between meta-data and value, and value element sizes of each DBR type. Note that the EPICS Epoch is 1990-01-01T00:00:00Z. This is 631152000 seconds after the POSIX Epoch of 1970-01-01T00:00:00Z. The strings field is an array of 16 string of 26 characters. The number_of_string_used gives the number of entries in the strings field which are valid. Additional strings should be ignored, even if they contain non-null bytes. Although there is no requirement as to which port numbers are used by either servers or clients, there are some standard values which must be used as defaults, unless overriden by application. Based on protocol version described in this document (4.11), port numbers used are CA_SERVER_PORT = 5064 and CA_REPEATER_PORT = 5065. Since registration of port numbers with IANA and in the interest of compatibility, the version numbers are unlikely to change. Therefore, the port numbers described here (5064 and 5065) may be considered final. This section lists various constants, their types and values used by protocol. Some constants can be combined using logical OR operation. Example: Monitor mask of DBE_VALUE and DBE_ALARM are combined using (DBE_VALUE or DBE_ALARM) resulting in (1 or 4 == 5). To query the whether certain value is present in such combined value, and operation is used. Example: to query whether DBE_ALARM of monitor mask is set, (DBE_VALUE and MASK > 0) will return 0 if DBE_VALUE is not present, otherwise DBE_ALARM is present. Indicates which changes to the value should be reported back to client library. Different values can be combined using logical OR operation. DBE_VALUE - value 1 (0x01) - Value change events are reported. Value changes take into consideration a dead band within which the value changes are not reported. DBE_LOG - value 2 (0x02) - Log events are reported. Similiar to DBR_VALUE, DBE_LOG defines a different dead band value that determines frequency of updates. DBE_ALARM - value 4 (0x04) - Alarm events are reported whenever alarm value of the channel changes. DBE_PROPERTY - value 8 (0x08) - Property events are reported when some metadata value associated with the channel changes. (Introduced in EPICS Base 3.14.11). CA Servers SHOULD ignore unknown monitor mask bits. Older PCAS versions will respond to unknown bits with ECA_BADMASK. Indicates whether server should reply to failed search messages. If a server does not know about channel name, it has the option of replying to request or ignoring it. Usually, servers contacted through address list will receive request for reply. Type: not defined, depends on the field it is in (usually UINT16). DO_REPLY - value 10 (0x0a) - Server should reply to failed search requests. DONT_REPLY - value 5 (0x05) - Server should ignore failed requests. Defines access rights for a given channel. Accss rights are defined as logicaly ORred value of allowed access. CA_PROTO_ACCESS_RIGHT_WRITE - value 2 (0x02) - Write access is allowed. As a reference, the following values are valid. Servers MUST set undefined bits to zero. Clients MUST ignore undefined bits in this field. This example shows construction of messages. For details of individual structures, see message and data type reference (CA_PROTO_READ_NOTIFY and DBR_GR_INT16). A client will send CA_PROTO_READ_NOTIFY message with the following contents. Server would respond with success and return requested value with individual DBR_GR_INT16 fields having the following values. A repeater MUST be used by clients to collect CA_PROTO_RSRV_IS_UP messages. Each client host will have one repeater. Each client MUST test for presence of repeater on startup, before any access to EPICS hosts is made. This check is made by attempting to bind to CA_REPEATER_PORT. If binding fails, the client may assume the repeater is already running and may attempt to register. This is done by sending CA_REPEATER_REGISTER datagram to CA_REPEATER_PORT. If repeater is already active, it will respond with CA_REPEATER_CONFIRM datagram back to client. At this point the registration is complete, and the repeater will begin forwarding messages to the client. If binding succeeds, then this client process MUST either close the bound socket (and report at error) or begin functioning as a repeater. If an error is encountered with sending CA_REPEATER_REGISTER, the the binding test SHOULD be repeated after a short timeout (1 second is RECOMMENDED). The repeater SHOULD test to see if its clients exist by periodically attempting to bind to their ports. If unsuccessful when attempting to bind to the client’s port, then the repeater concludes that the client no longer exists. A technique using connected UDP sockets and ICMP destination unreachable MAY also used. If a client is determined to no longer be present then the repeater un-registers that client and no longer sends messages to it. Each message the repeater receives MUST be forwarded to all registered clients. Repeater should not shutdown on its own, if it does, there should be no active clients registered with it. This section describes one possible strategy for handling CA_PROTO_SEARCH messages by a CA client. It is designed to limit the maximum rate at which search messages are sent to avoid overwhelming servers. For each outstanding search request the following information is kept. A priority queue should be maintained which is sorted in order of increasing nextSend. When a new search request is made, a new searchPV is added to the queue with initialMult at a minimum (eg. 0.05 sec.) and nextSend at the present time plus nextSend. When a search request is canceled it should be removed from the queue. A task should run whenever the first entry expires (nextSend before the present time). This task should extract some expired entries up to a maximum limit (eg. enough for 4 UDP packets). Search messages are then sent for these entries and their intervalMult is increased (eg. doubled), their nextSend is set to the present time plus nextSend, and they are re-added to the queue. The task should then wait for the minimum search interval (eg. 0.05 sec.) before checking the queue again. This prevents a flood of search messages. The combination of the minimum interval between sending search messages, and the limit on the maximum number of messages sent in each interval, acts to limit to total network bandwidth consumed by searches. This section covers return codes and exceptions that can occur during CA command processing. In general, exceptions will be used to report various events to the application. Return codes are predefined values for conditions that can occur, where as exceptions are actually reported. Apart from exceptions that occur on server or due to network transport, additional error conditions may be reported on the client side as local exceptions. Return codes are represented as UINT16. The 3 least significant bits indicate severity, remaining 13 bits are return code ID. Return codes are communicated in the protocol by the CA_PROTO_READ_NOTIFY, CA_PROTO_WRITE_NOTIFY, monitor subscription responses, and the CA_PROTO_ERROR responses. Historical error conditions. Servers and clients SHOULD NOT send these codes, but MAY receive them. This is example conversation between client and server. Client first establishes TCP connection to the server and immediately requests creation of a channel. After server aknowledges channel creation, client reads the value of the channel twice. First as a single string value and second as a DBR_GR_INT16 type. After the response to both queries has been received, the channel is destroyed. Reusable TCP connection between client and server, through which all PVs hosted by the server can be conveyed to the client.